At the end of WWI, the Royal Navy faced a crisis. During the war, it had suspended new capital ship construction except for a handful of battlecruisers, while the American and Japanese building programs had continued to churn out ships that were more modern than the bulk of the British fleet. Worse, the British battlefleet had seen hard war service, and many of the early dreadnoughts were in bad shape and essentially unfit for further service. New battleships would be needed, ships that fully reflected the lessons of the war. The most important of these was the need for an all-or-nothing armor scheme, as developed in the US. The war had seen major improvements in armor-piercing shells, and they required significantly more armor than previous vessels. However, the increased range gave designers a way out. Previously, the size of citadels had been set by the need to preserve stability and buoyancy if the ends were riddled. At long range, the many hits necessary to riddle the ends would not happen, and the citadel could be shrunk to thicken the armor.1 The British also looked to improve on the 15" gun due to the proliferation of 16" weapons in the American and Japanese navies. They investigated the triple turret, abandoned a decade earlier amid fears of increased mechanical complexity, and the 18" gun under the cover name of 15"/B. 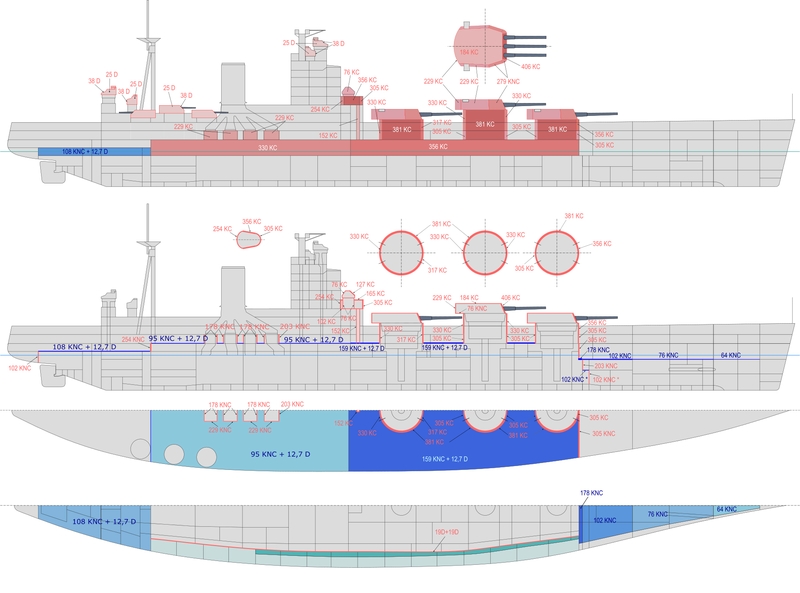 Two parallel design series were started, one for battleships, the other for battlecruisers.2 As this series was developed, the designers saw a serious problem with the battlecruisers. 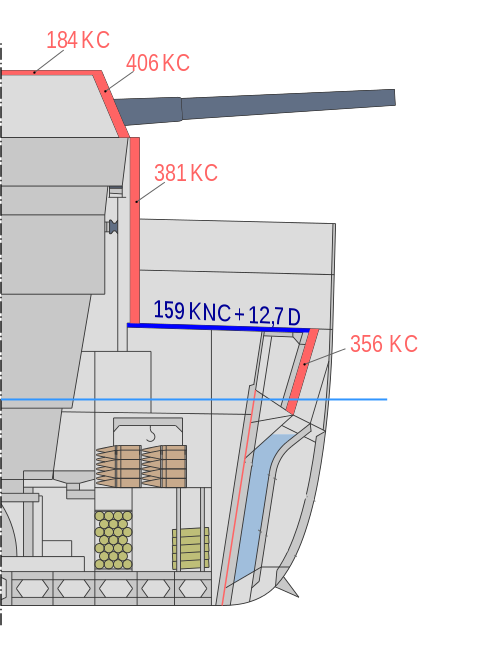 The boiler uptakes would leave large holes in the armored deck, and if the ship was headed towards the enemy, shells might be able to pass through the holes and into the aft magazines. The solution was to move all three turrets forward of the engines, on the basis of war experience showing that ships rarely if ever engaged targets directly aft. The design process for the ships that became the Nelson class was unlike any previous warship. For the first time, designers were working under a hard constraint on displacement, which they needed to approach as closely as possible to gain the maximum possible combat power. 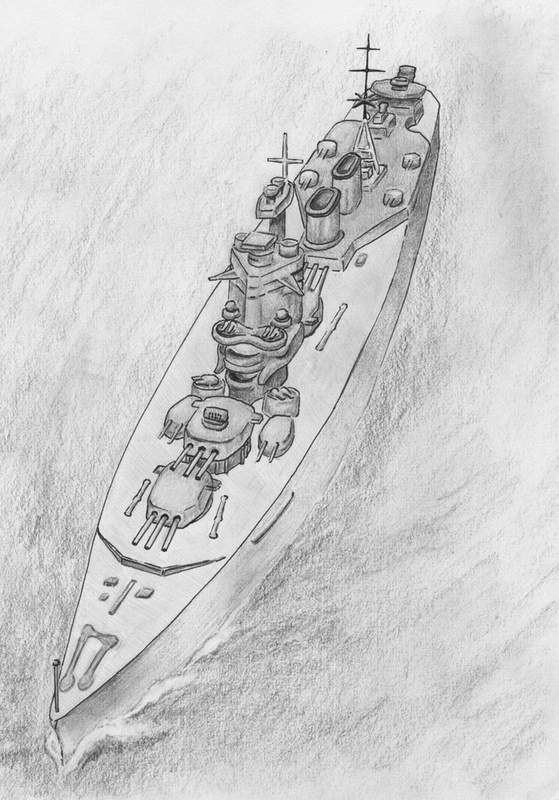 During the treaty negotiations, the British had investigated what could be done within the allowed limits, for both battleships and battlecruisers, but once the treaty was signed, the decision to build battleships followed swiftly. 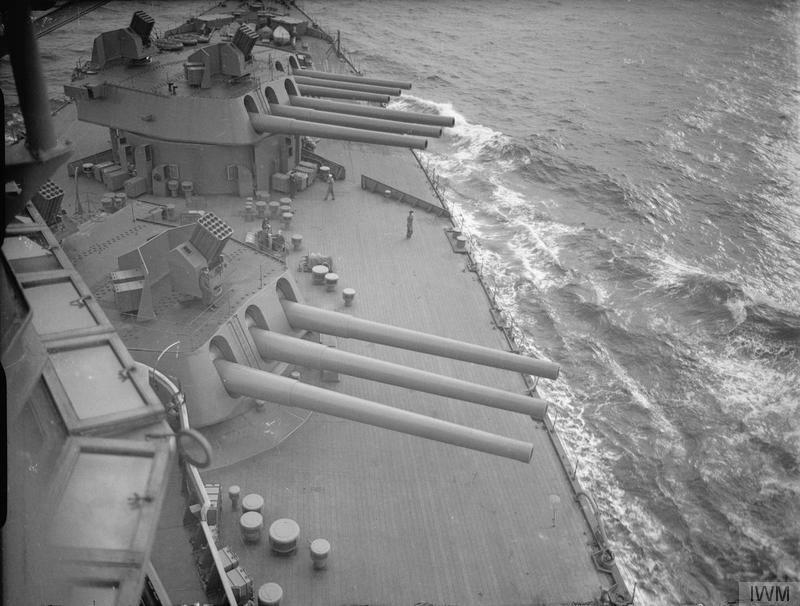 Speed was set at 23 kts, and the armament was to be three triple 16" turrets. All three turrets were moved forward of the superstructure, bringing them as close together as possible and reducing the size of the heavy magazine even more.7 Uniquely among British dreadnoughts, the Nelsons had only two shafts, and the engines were placed forward of the boilers to keep the superstructure free of smoke and the holes in the deck for the uptakes as far from the magazines as possible. The armament was a major departure from previous British practice. The 16"/50 guns were designed to fire a rather light projectile very fast, on the basis of inadequate trials that indicated that this would provide superior penetration on oblique impacts. In practice, this simply was not true, and the resulting weapons were only very slightly superior in armor penetration to the 15"/42 of previous classes, while suffering greatly in accuracy and barrel life. A reduction of muzzle velocity mitigated these problems, but budget limits prevented the adoption of the heavier shells that would have been necessary to make the guns really satisfactory. The triple mounts were also a first for British battleships, and extensive safety measures were fitted as a result of the disaster at Jutland. These factors, combined with the drive for weight reductions, resulted in weapons that were initially unsatisfactory, although most of the bugs had been worked out by the start of WWII. Even then, it was slow to load, usually only able to fire about 1 round/gun/minute.12 The blast from these guns was ferocious, and they would do significant damage to the ship if fired abaft the beam. This was probably exacerbated by the light construction of the ships. The secondary armament of these ships was also rather interesting. While they had separate 6" anti-destroyer and 4.7" anti-air batteries, they were the first battleships designed to carry significant light AA armament in the form of four pom-poms. 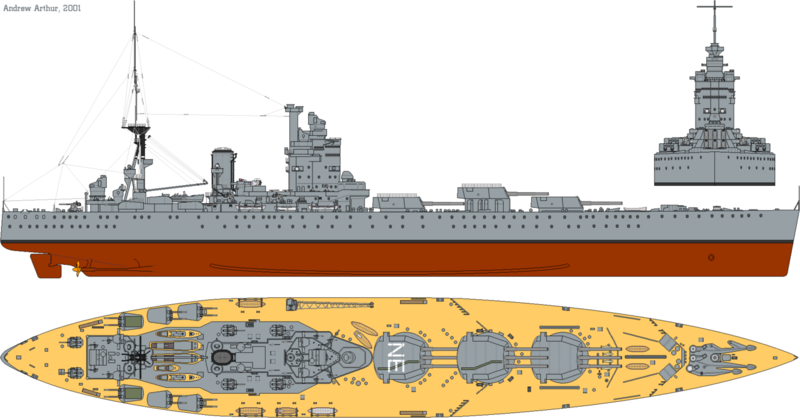 Nelson and Rodney were the last battleships designed with internal torpedo tubes, being fitted with unique 24.5" torpedoes. During her battle with Bismarck, Rodney fired two, the only known torpedoes fired by one battleship at another. These weapons used air enriched in oxygen to give improved performance, serving as precursors to the famous Japanese Long Lance. Because the G3 configuration had been kept under wraps, the unconventional arrangement in Nelson and Rodney came as a shock to almost everyone. The third turret, dubbed X,14 was nearly admidships, and the unique profile lead to them being dubbed Nelsol and Rodnol, after a class of fleet tankers with names ending in -ol. The bridge being so far aft meant that the ships maneuvered rather differently from other vessels, although once the crew was used to their quirks, they proved reasonably handy. Nelson and Rodney are fascinating ships. They were the first battleships to take into account all the lessons of the First World War, but built shortly after the war, instead of nearly two decades later. They served throughout World War II, and Rodney is best known for her part in sinking Bismarck. She and Nelson gave good service around the world, proving substantially more useful than the 15"-gunned ships, although they were little loved and both went to the scrapyard soon after the war. What does it mean for something to be "abaft the beam"? I'm guessing "abaft" means behind. But what is the "beam"? Quanticle, I just looked this up. And I think I understand what I've read. The beam was to the side of the ship, at 90 degrees to the fore/aft line. So 3 o'clock and 9 o'clock if that terminology is more familiar. Abaft the beam was behind that. So in this case, firing the guns in any direction that is pointing to the rear of a straight broadside. Doctorpat is correct. I really need to find and link a good naval glossary.